in Meadowlark Park, Edmonton Announcing a price drop on 15909 93 Ave NW, a 1456 sqft , 3 bath , 5 bdrm single story. Now FOR SALE CAD419,888 . • 1456 sqft , 3 bath , 5 bdrm single story – FOR SALE CAD419,900 . This is the one. Absolutely solid 1400 sq ft 3 bedroom bungalow in the highly desirable neighbourhood of Meadowlark Park. 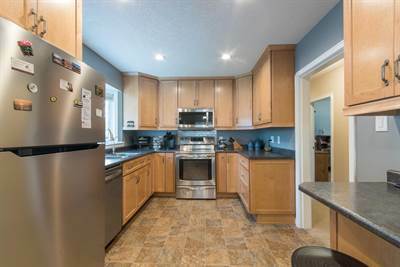 This home has had many main floor and exterior upgrades including siding with 1″ foam insulated added to it, shingles, Triple Glazed, low E, argon Glass windows, Gorgeous kitchen with cabinets to the ceiling and most of the flooring. The plush carpet hides the original hardwood, which has been under carpet since installation. There is one 4 pc bath and a 2 pc ensuite with plumbing to add in the shower (was removed years ago) on the main floor and a 3 pc bath in the basement. The basement has been partially gutted, but still has 2 bedrooms in addition to the bathroom. It is well suited to the creation of a 3 bedroom suite with a separate entry at the back porch, high ceilings and enough space to create something amazing. 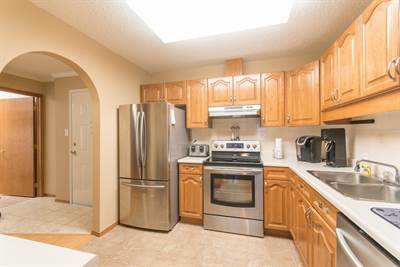 The double detached garage and front drive provide for ample parking, and the home is walking distance to the local high schools and recreation centre. in Summerlea, Edmonton Announcing a price drop on 209 17151 94A Ave NW, a 978 sqft , 2 bath , 2 bdrm apartment. Now FOR SALE CAD199,900 . 12206 127 St NW in Sherbrooke, Edmonton is Sold! 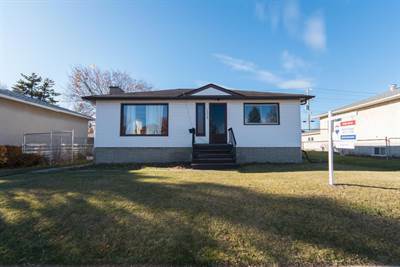 in Sherbrooke, Edmonton The bungalow at 12206 127 St NW has been sold. Posted on July 16, 2018 Categories UncategorizedLeave a comment on 12206 127 St NW in Sherbrooke, Edmonton is Sold!